Arcooda Pinball is different. It’s a video pinball, it’s a gaming machine, it’s endless gaming options. The machines we are building are designed to be enjoyed, with no shelf life – gaming is our passion, and the cabinet’s limitation is governed by your imagination. Arcooda is working with a number of software publishers with the goal of plug and play software. No cabinet modification, software massaging, or high technical experience. Install games and “play”. First and foremost, Arcooda Pinball is a video pinball machine – we have tried to replicate the feel and game play of traditional pinball machines, coils, lights, shaker, tilt/nudge, fans and features are all reproduced. However the biggest advantage is you can have many video pinball tables on the one machine. Easily change from Timeshock Arcade Edition, to Addams Family, to Dr Who Master of Time. And, just keep adding more titles. 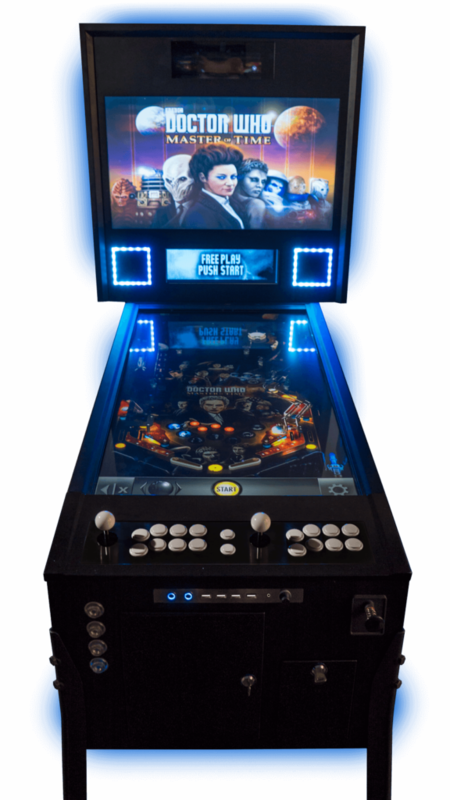 We are gamers – so we want to maximise the benefits of our video pinball machine. It supports XBOX 360, XBOX One, PlayStation 3, PlayStation 4, PC, Android, Nintendo Switch – and more (we will explain when the cabinets are released). Arcooda builds arcade machines, not toys. Everything has been designed by amusement experts and is continuously improved so that you do not need to worry about servicing. If there is a problem, servicing is just a matter of unplug/replug the component and you are back in action. No soldering, multimeters, or technical serviceman call outs – all can be handled by you. Arcooda backs its products with unlimited 12 months warranty. With the unfortunately loss of the Williams/Bally license, Arcooda Pinball Arcade is now a limited edition product (until sold out). We are working with other software partners to introduce new video pinball titles and “off the shelf” Steam pinball tables work perfectly on Arcooda Pinball. Its very easy to quickly have over 250 licensed video pinball tables….then start adding your arcade games. We are excited for what the future holds, leading software publishers are interested to cooperate, and we are moving forward shortly with our coin operated series of Arcooda Pinball machines. If you are looking for the highest gaming experience, with unlimited options, then Arcooda Pinball Ultra is your first choice. Front End Launcher enabling both Arcooda game software, and standalone (from the market) software to be added. The Arcooda Pinball Pro is a traditional plywood timber cabinet, made by professional USA pinball manufacturer with Arcooda’s unlimited game options. Machines manufactured in USA – pickup is Elk Grove Village, Chicago, USA. Don’t need 4K gaming experience, but still enjoy all the features of video pinball action? The standard Arcooda Pinball machine already offers endless gaming experience with options for upgrade. Pickup ex warehouse – Guangzhou, China. 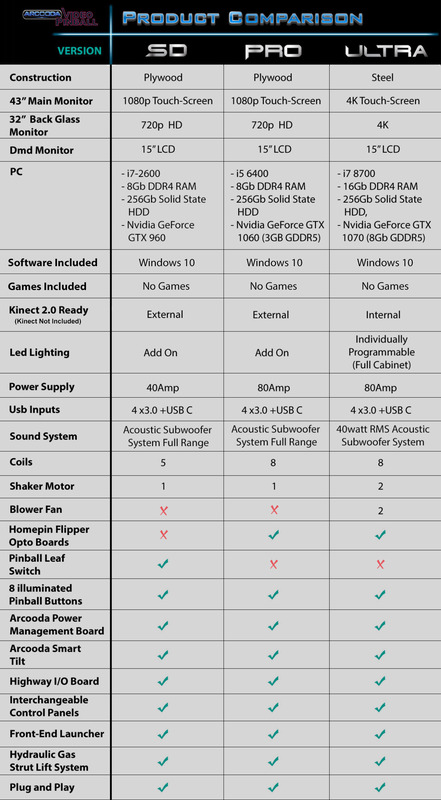 NOTE: Due to the changing nature of components (end of line, etc), above specifications are subject to change. We do we our best to substitute with at least the same specifications/quality.